These nineteen Scripture songs are sung simply and from the heart with the true message ringing clear and fresh. The wide range of musical styles, ranging from folk to calypso, Scotch-Irish to mariachi, bluegrass to Jewish and more, are sure to make an exciting and enjoyable listening experience, and the catchy tunes will quickly find themselves being sung at work and at play by young and old alike. 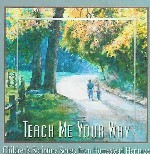 Here is another great CD with more Scriptures Songs that are word-for-word. If you loved the first one, you will love this one too.